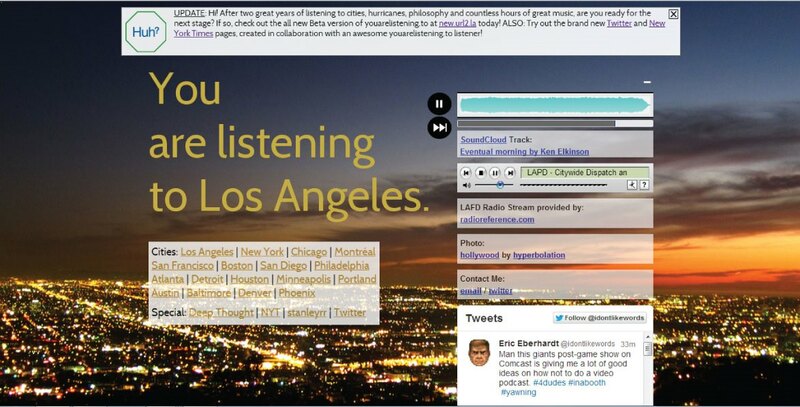 An oldie but a goodie, youarelistening.to has been around for a couple of years now. It places live police scanner feeds over ambient textures and slow-glitching ditties sourced from Soundcloud. Think COPS meets Brian Eno. Defaulting to the original City of Angels, the recent beta version has expanded to include cities outside the U.S. such as Montreal and Brisbane. Due to the live nature of the feed its reliability may be intermittently sketchy and it is not compatible with iOS. Still, the alchemy of serene soundscapes against the dysfunctional masses together with the occasional sarcastic cop makes for an engaging and pleasurable background score should you be simply studying or perhaps after a while, just less inclined to leave your house.